Do you fancy some Thai fruit? 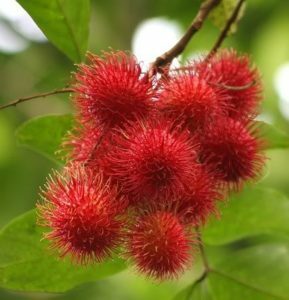 In this learn Thai lesson, we will talk about the Thai fruit– Rambutan. Rambutan is not easily available in most Western societies but is abundant here in Thailand and South East Asia. The fruit is a orange/red/green and grown on trees with a strange almost furry outer shell, white fruit inside with a large seed in the center. For most foreigners it does look very strange. Rambutan are grown across Thailand but most famous province for Rambutan is Rayong in the East of Thailand close to Pattaya. The season for Rambutan is Summer – June, July and August when the markets are full of this wonderful fruit. To open a Rambutan first hold the rambutan in it’s center between thumb and fingers. Squeeze tightly and with your other hand attempt to pull the top off. It should come off in one piece. It takes a bit of practice so get someone to show you. It is always interesting to give a foreigner one of these fruit and watch them attempting to open it. Rambutan in Thai is called, เงาะ /ngɔ́/. Apart from a good taste, เงาะ /ngɔ́/can relieve the symptoms of diarrhea. Let’s try some Thai fruit! Hope you enjoy eating Thai fruit! If you would like to find information about more Thai fruit and vegetables or would like to learn Thai more then please look at this site for more lessons. We have over 450 Thai lessons here and 250 video Thai lessons on our YouTube site. You are welcome to use these. If you are serious about learning Thai then we will be happy to teach you with lessons online wherever you are. Hope to see you in the next lesson.